ON APRIL 18, the Supreme Court put the fate of Vedanta’s bauxite minining project in Odisha in the hands of people. 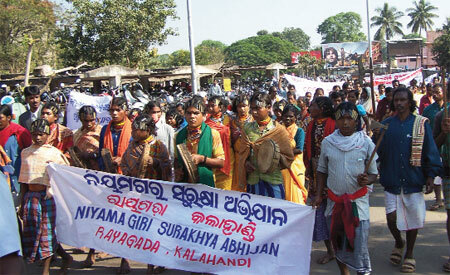 It asked gram sabhas of the affected villages in Rayagada and Kalahandi districts to decide whether the tribals living in and around Niyamgiri hills have religious rights over it. Their “rights have to be preserved and protected”, it said. The Odisha Mining Corporation Limited (OMC) and Sterlite Industries, the Indian arm of Vedanta, propose to mine bauxite from 660 hectares (ha) of forestland on Niyamgiri for Vedanta’s alumina refinery in nearby Lanjigarh. Though the Ministry of Environment and Forests (MoEF) gave priliminary clearance to the project, it quashed the approval in 2010, saying the project violated provisions of the Forest Conservation Act, Environment Protection Act and the Forest Rights Act (FRA). It also contended that the project violated religious rights of the Dongria Kondh and Kutia Kandha who worship the hill top of Niyamgiri as the abode of their deity Niyam Raja. In 2011, OMC challenged the decision in the apex court. The court observed while gram sabhas have settled most individual and community claims under FRA, the matter of religious rights was not properly placed before them. The gram sabhas will give their views on religious rights in three months, based on which MoEF will decide whether to grant stage-II clearance to the project. The gram sabhas can also consider fresh claims under FRA. To ensure that gram sabha proceedings are not influenced by project proponents, the state government or the Centre, the court directed that the proceedings be recorded in the presence of a judicial officer of the rank of district judge. The court also directed Vedanta’s alumina refinery project to correct the alleged violations in terms of environment clearance. Vedanta got the clearance based on false information that no forest land would be used for the project and started expanding the refinery capacity by six-fold without approval from MoEF. The ministry will consider the corrected measures while deciding on the mining project, the court said. “The judgement recognises the integrated way of living of tribals along with nature,” says Sanjay Parikh, a Supreme Court lawyer who represented the tribals in the case. “Though everything that the court said was there in the law, the project proponents were never ready to accept religious rights of the tribals. The court has reiterated that it is the job of the gram sabha to decide whether such rights exist or not; project proponents, state or the MoEF will not have any say in that,” he says. Shankar Gopalakrishnan of advocacy group Campaign for Survival and Dignity, says by sending the matter back to the gram sabha because a key matter was not placed before it, the court has treated gram sabha as a statutory, legal authority at the same rank as, say, MoEF. Analysts say the judgement is a blow to the Centre’s recent attempts to undermine the authority of gram sabha. A 2009 order of MoEF states all projects that require forestland diversion must obtain consent of gram sabha. However, in a change of stance during a hearing of Niyamgiri mining case on February 15, MoEF told the court that people’s consent is required only in cases where a large number of people are displaced and which affect their quality of life. A report by the Prime Minister’s Office on the investment climate in the country last year has also reportedly recommended doing away with the consent of gram sabha for forest diversion. MoEF has since exempted linear projects like railway tracks, roads and transmission lines from the requirement of the gram sabha consent. The judgement may have implication on several mining proposals. While the court says the state has the power to reserve any area for mining for a public sector corporation, like OMC, it maintains that communities’ religious rights have to be protected. “For rights other than religious, it does not say anything. But those are legal rights that MoEF cannot overrule,” says Gopalakrishnan.